Dolls House Rose Cranberry Bowl 1/12th Scale (00541). Dolls House Fluted Cranberry Vase 1/12th Scale (00551). Dolls House/ Model Railway Remote Control 24 Independent output channels (01243). Dolls House Remote Lighting Controller Infra-red remote controller with 24 independent outputs Each output can power 4 bulbs (4x24=96 total) All connected lights can be dimmed This Remote Control requires a 5 Amp 12 DC power supply. 24 Outputs each of which can power 4 dolls house type bulbs Features include, individual On/Off and Dimming of all 24 outputs. There is a save key, which stores all settings in internal memory, so after turning the remote controller off, it will remember all the dolls house bulb settings, (off/on/dimmed). When next turned on the lights are restored as previously set. The controller also has an master all lights on and all lights off feature, and master dimmer. You can also program blocks of lights, for example 1 key could turn on a entire floor in your. Dolls House Remote Lighting Controller Infra-red remote controller with 24 independent outputs. 24 Outputs each of which can power 8 dolls house type bulbs (192 total). Features include, individual On/Off and Dimming of all 24 outputs. You can also program blocks of lights, for example 1 key could turn on a entire floor in your dolls house. 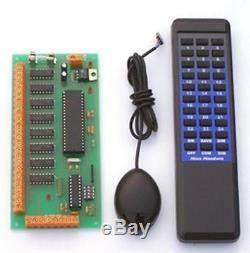 Supplied with remote control handset and infrared receiver. For up to 80 bulbs use a 12 Volt 5 Amp DC Power Supply. Between 81 and 140 bulbs use a 12 Volt 8 Amp DC Power Supply. For 140 to 192 bulbs use a. 12 Volt 10 Amp DC Power Supply. Tab below for full details. Microminiatures specializes in dolls house miniatures, model railway miniatures and electronic accessories. Order before 2pm for same day dispatch. Thanks for browsing our store. 100 x 1/8W 5% Carbon film Resistors 1/8 Watt 10 ohm - 1M ohm 0.125W. 100 x 1/4W 5% Carbon film Resistors - 1/4 Watt 10 ohm to 1M ohm 0.25W. Pack of 10 3mm or 5mm LEDs with Resistors for 5 Volt or 12 Volt Operation. Dolls House Lighting Starter Kit with 12 volt 2 amp Power Supply for 40 Bulbs (01538). Related products you may also like. Tiffany Dolls House Table - Floor & Ceiling Lighting Set 1/12 Scale 12 Volt (01552). Dolls House Glass Patterned Ceiling Light 1/12th Scale (01477). Dolls House Single Ceiling Light 1/12th Scale (01485). Dolls House Globe Shade Ceiling Light 1/12th Scale (01475). Dolls House Black Candle Wall Lamp 1/12th Scale (01469). Microminiatures specializes in dolls house and model railway miniatures and electronic accessories. The item "Dolls House/ Model Railway Remote Control 24 Independent output channels (01243)" is in sale since Tuesday, December 13, 2016. This item is in the category "Dolls & Bears\Dolls' Miniatures & Houses\Lighting/ Lamps". The seller is "microminiatures" and is located in GB. This item can be shipped to United Kingdom, Austria, Belgium, Bulgaria, Croatia, Cyprus, Czech republic, Denmark, Estonia, Finland, France, Germany, Greece, Hungary, Ireland, Italy, Latvia, Lithuania, Luxembourg, Malta, Netherlands, Poland, Portugal, Romania, Slovakia, Slovenia, Spain, Sweden, Australia, United States, Canada, Brazil, Japan, New Zealand, China, Israel, Hong Kong, Norway, Indonesia, Malaysia, Mexico, Singapore, South Korea, Switzerland, Taiwan, Thailand, Saudi arabia, South africa, United arab emirates, Ukraine, Chile.